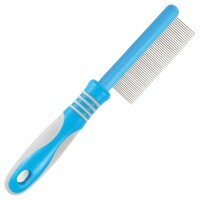 Ancol Ergo Flea Comb is ideal to identify and combat fleas on your beloved cat and dog. The teeth of this comb are far enough apart to pass through your pets fur, but close enough together that they'll scrape any fleas off of the follicles. Then simply dip the comb into a bowl of soapy water to kill the fleas. Please note: If a flea infestation is discovered, this product will need to be used in conjunction with a medicated shampoo. Amazing product! A must have for every cat/ dog owner, it does what is says... it traps flea eggs and fleas!